Klossner: Should a leader be tech savvy? I am a Boston Celtics fan. In the final game of the recent NBA championship series, when the Celtics had a commanding lead, the Los Angeles Lakers were making Caribbean reservations, and the game and the series was over in every way except time on the clock, it was reported that Danny Ainge, the general manager of the Celtics, received a text message from Larry Bird, the Celtics god who was a former teammate of Ainge's and is now the president and general manager of the Indiana Pacers. The message, to the best of my memory, was a basic one line: congratulations. I refer to this in light of recent stories and discussions concerning John McCain's technology -- or, more accurately, lack of technology -- skills. In an interview, he said he hadn't "mastered" the Internet, and that his wife helps get him online, where he reads a couple news sites and political blogs. This has led to a discussion about whether a leader needs to be tech savvy. What does it mean, in this day and age, to be "tech savvy?" Able to turn on a computer? Google "campaign donors?" Build and maintain your campaign's online store? Someone who can maintain a blog, upload video to YouTube, and create a MySpace site looks illiterate next to someone who can write code. Back to the Celtics. 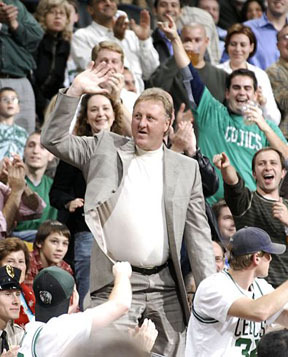 Larry Bird is a very successful person who grew up in a pre-technology generation. He is the head of a multi-million dollar corporation -- a CEO, if sports teams used that term. He has every excuse in the world to say "I don't have technology skills." Heck, he could say "I don't need technology skills" and it wouldn't change his accomplishments in 1986. His leadership skills are not in question, and I'd be willing to bet he could make a good run at the any political seat in Indiana he chose, were he so inclined. Heck, I'd even bet he didn't send the text message. He could have called an intern at 10:00 that Tuesday night and had him send the message for him. Larry Bird could have picked a name out of the Indianapolis phone book and had them send the message for him. And that's my point -- it's irrelevant whether John McCain has tech skills or not. It is more relevant whether the communication needs of the position get handled. No, the point here is why would a leader such as McCain make their lack of technology skills so blatant? Wouldn't he be demonstrating how the delegation of these skills will work by delegating them NOW? In the campaign? Wouldn't he want the millions of people for whose votes he is courting, who do know and use technology every day, to feel that he, the candidate, is familiar with the issues of most people's lives? By making light of his lack of technology know-how, McCain has the potential of turning this into his version of the grocery store scanner event. This is not meant to say that the McCain folks are doing a terrible job, technology-wise, in their current activities. By all accounts the McCain campaign has used all the present technologies as well as anyone. But I'm missing the point where the candidate says, "I'm not the best text messager, but my campaign gets out 2,000 of them per hour, and this shows that my administration will be able to keep up with all the latest technologies." Maybe McCain is worried about the dangers of technology. This could be a quiet start to a future technology-related health program. There are some who want to treat a candidate's technology expertise as a reflection of personal values. It has been said that someone who, in this day and age, hasn't learned how to get online reflects a lack of curiosity. I'm willing to give them the benefit of the doubt -- they've been busy. But sooner or later not knowing how to get online will become the equivalent of a candidate saying "I don't speak English, but my wife translates everything for me." Larry Bird could get away with it.